Kellie Pearson, a mental health clinician in Massachusetts, thinks she spent about $2,000 to receive phone calls from her late fiance Michael Ray during the two years he was incarcerated pretrial on armed robbery charges at the Bristol County House of Correction. In that jail, the phone services provider Securus Technologies charges $5.40 for a 15-minute in-state phone call — more than three times the amount it charges for the same call from Massachusetts state prisons, according to a February report by the advocacy group Prison Policy Initiative. Claiming an "illegal kickback scheme" between Securus and the local sheriff's office effectively doubles the cost of accepting calls, Pearson has joined a Boston area law firm and several other named plaintiffs in a proposed class action that seeks to bring down prices. She told Law360 that the sheer expense of picking up the phone sometimes prevented communication between her fiance and his attorney. "A lot of times he would be in court," she said of the lawyer. "If he didn't have information to give to Michael, he's not gonna pay for a collect call to say nothing new. Whereas if it wasn't collect, he maybe would have picked up and calmed Michael's nerves." When Ray's attorney wouldn’t answer, Pearson said her fiance often called home instead, forcing her to pay and serve as intermediary. "Think of a poor person who doesn't have a family member who can call, how are they supposed to get in touch with their lawyer?" she said. "These are mostly folks who have not even been convicted." Such challenges are felt beyond Pearson's small Massachusetts county. 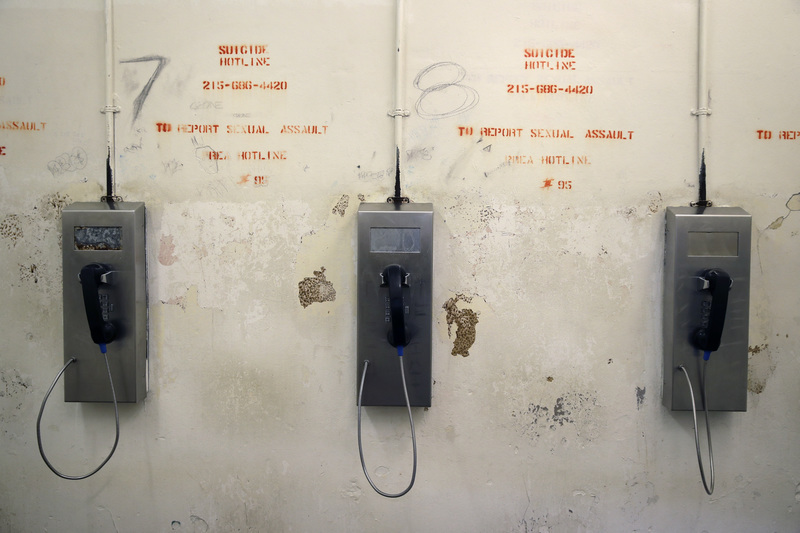 PPI's report last month detailed how successful efforts to cap phone rates in state-run prisons have failed to translate to county- and city-run jails across the country. The local facilities' high inmate turnover rates make sustained political pressure difficult, the report said, adding that cash-strapped local governments are particularly likely to seek contracts promising a cut of the phone revenues in the form of commission fees. 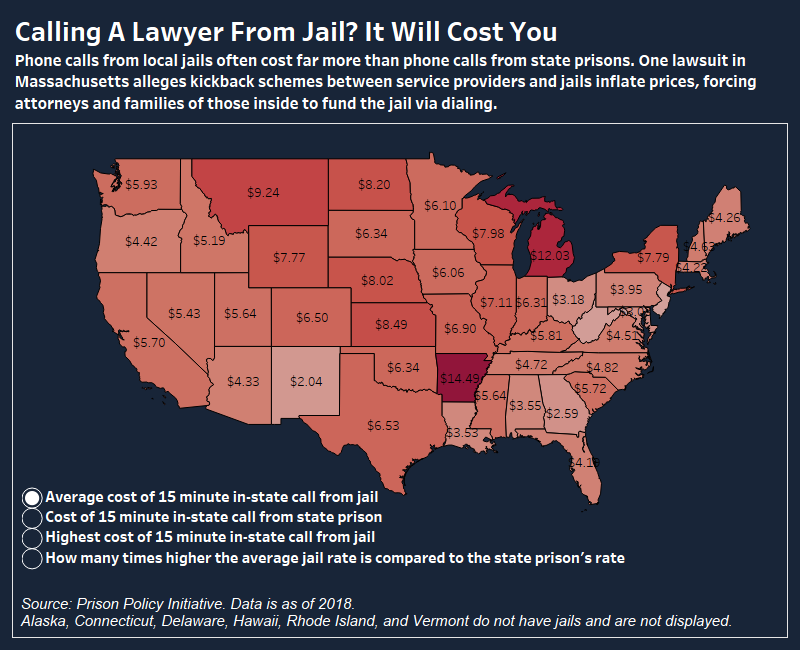 As a result, it's often cheaper to call your attorney or loved ones from prisons than from jails. In Illinois, for example, state prisons have negotiated for in-state phone calls costing less than one cent per minute, while in-state calls from local jails cost 52 times as much. In Michigan, a 15-minute in-state call from some jails costs as much as $22, and in Arkansas, the same call can cost nearly $25. These costs are generally borne by the recipients of the calls because the inmates dialing out have already been stripped of all the things they came in with, including money, according to Wanda Bertram, a communications strategist at PPI. "It's your lawyer or your family who pays for it," she said. A spokesperson for Securus said the company's mission is to help incarcerated individuals connect with their families. "Without significant investments in security and technology infrastructure, these connections would not be possible," the spokesperson added. "Securus works hard to keep costs as low as possible while also covering the millions of dollars it takes to build that infrastructure." The spokesperson also said that a large portion of Securus' revenue is returned for public use in many jurisdictions, where years of budget reductions have made alternative revenue streams like phone service provider commissions critical for funding supplemental programming like addiction workshops and education. But according to Brian Highsmith, a National Consumer Law Center attorney representing the proposed class in Massachusetts federal court, Securus' agreement to pay Bristol County a lump sum of $820,000 in "kickbacks" for service through next year should be barred. The complaint cites a 2010 Massachusetts Supreme Judicial Court decision that found sheriffs cannot charge inmates or their families fees without legislative authorization. It’s really senseless to make prisoners’ families and attorneys pay for the cost of running the prison through their phone calls. "Rather than attempt to assess fees directly, the sheriff's office ... is arranging for Securus, a private vendor, to extract revenue from prisoner phone calls on its behalf and then redirect them to the sheriff," Highsmith told Law360. "It's really senseless to make prisoners' families and attorneys pay for the cost of running the prison through their phone calls." In January court filings, Bristol County Sheriff Thomas Hodgson and Securus both denied their agreement constitutes an illegal kickback scheme. Sheriff Hodgson appeared on local radio in May, saying the "suit is really a frivolous lawsuit" and adding that "thousands [of jails] across the country ... have these phone contracts to support the programs for inmates and support the phone service itself." "There are 10 other sheriff's departments in the commonwealth that actually charge these commissions for the phones," he said, noting that jail calls are extra expensive because they must be monitored. "Taxpayers are already paying, on average, probably about $26,000 a year per inmate ... why should the people who stole their kids' bikes or broke into their homes go to prison and think ... 'they can pay for my phone calls'?" The case, filed in May, is now proceeding to discovery, and though Highsmith said he hopes to see more litigation challenging such schemes in the future, he noted that his litigation strategy is specific to Massachusetts due to the 2010 state court decision on which its based. "We could not bring a virtually identical case in other states unless they also governed site commissions in the same way," he said. "States have taken different approaches to regulating the cost of phone calling." Resistance to attempts at regulating the jail phone services industry on a national level has been strong, especially after the Federal Communications Commission reined in the cost of interstate calling in 2014 via rate and fee caps. When the agency went a step further and attempted to cap intrastate calling rates in jails as well as prisons, Bergman said the FCC received immense blowback from the telecom companies. 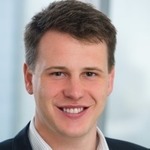 That blowback took the form of a petition brought by Securus and several of its main competitors that alleged the FCC was overstepping its authority. After President Donald Trump appointee Ajit Pai — who represented Securus before being appointed — took control at the agency, the FCC abandoned its attempt to set intrastate caps. The resulting lack of regulation in the industry, Bertram said, has an outsized effect on attorneys who frequently represent jail inmates. She cited a 2013 letter the Missouri State Public Defender's office penned to the FCC, claiming phone calls cost over $75,000 per year. "It hurts public defenders the most because they have the fewest resources to work with already," Bertram said. "Unlike people in prison, people in jail are overwhelmingly not convicted of any crime. Down the line, that creates a distortion of justice when folks have to pay so much to talk to their counsel." For Pearson and others like her, the suit in Massachusetts could lead to reimbursement for all the money they spent accepting calls from their loved ones. But Pearson noted that Ray, who died by suicide while awaiting trial, will never be compensated for the toll the costs of calling had on his mental health. "He had a definite mood disorder and he was struggling with anxiety and the cost of calls just added to that," Pearson said, noting that she eventually told her fiance to stop calling so much because it was taking up too much of the family budget. "He ended up taking his own life. You can't say it was any one thing, but this was definitely an issue."